Note: As mentioned in previous posts, this blog remains focused on preparation of delicious food. Growing that food, for me, can certainly be a part of that goal. This blog will continue to primarily focus on cooking techniques, but this post is a short recap of my victories and failures in the garden this summer, and completes the short sub-series on gardening for this year. More cooking posts to come, and feel free to scroll past this post for several older cooking posts below. So, you may remember my excitement at the beginning of the summer when I planted my garden. You may also remember my plan to update frequently with the growth and abundant harvest of said garden. You may finally have noticed a glaring lack of such updates. Which is mainly because there was very little worthy of an update. The peculiar weather patterns this summer including a late start to the summer heat, a few periods of heavy rain and even some flooding followed by periods of drought made for poor growing conditions. The little swiss chard that sprouted was quickly devoured by the local gang of bunnies. I had a decent yield of tomatoes, although less than is typical. I’ve had the occasional decent pepper make it to maturity, but primarily the smaller, hotter peppers have fared better this summer. Overall, it was not my greatest showing as a gardener, and I hope to do better next summer. Regardless, below is a short recap of the summer gardening I did along with a small sampling of some of the results. The leeks, one of the few things I grew from seeds, did sprout, but I am skeptical that they will reach maturity before the cold of fall sets in. This photo was taken mid-summer, and, while they have gotten taller, they have not gotten much thicker. I plan to let them grow as long as possible, and will see what I get. 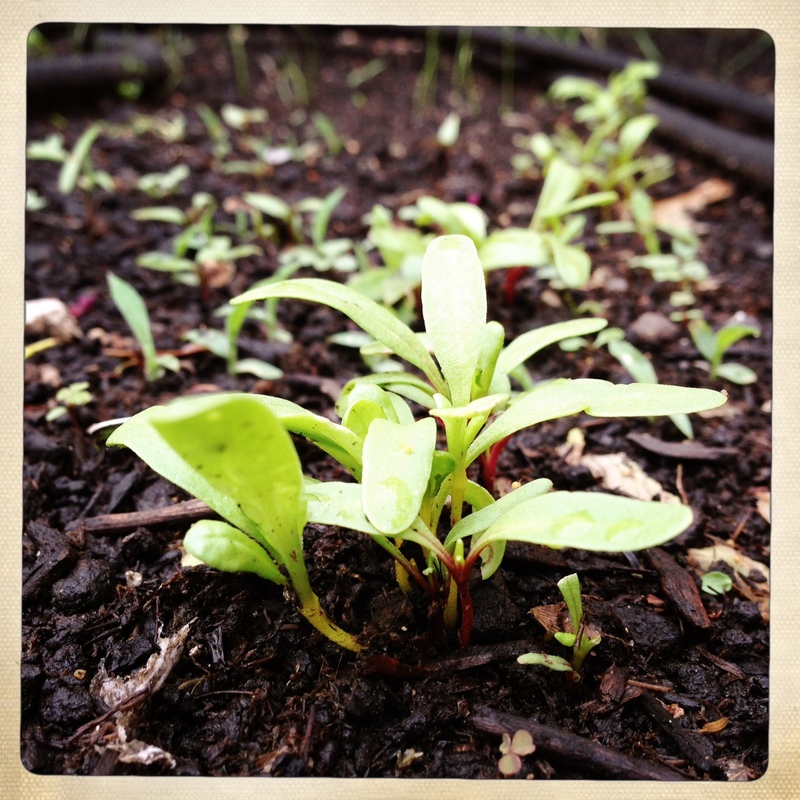 The rainbow chard sprouted early and was looking great back in early July. I thinned it appropriately, but apparently it was just too appetizing to the rabbits who ate the sprouts down to the dirt. Two subsequent plantings yielded nearly no viable plants. I usually have great luck with chard, so this was a disappointing failure. 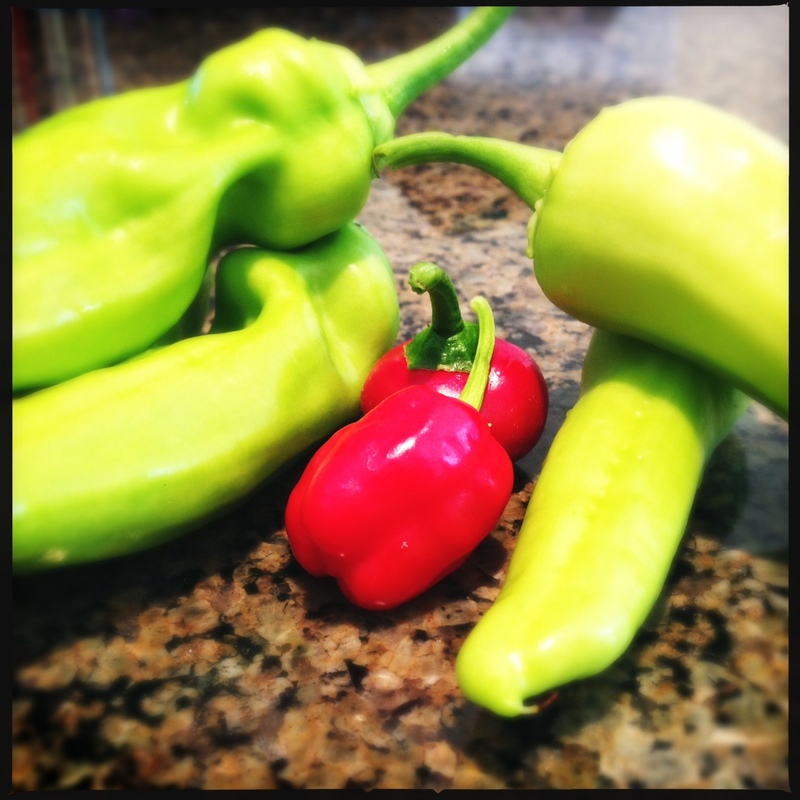 The pepper yield was not as plentiful as usual, but the results were still very good. Here are a few cubanelles, a few Hungarian hot wax peppers, a red cherry pepper and a mini red cajun bell. The habaneros and cayennes are also doing well. The bigger bell peppers and gypsy peppers never quite made it to maturity this year, though. Despite the less than stellar results with some of my garden regulars, the tomatoes did do quite well. The juliet and roma tomatoes have given us at least a good handful almost daily for the last few weeks. In fact, they were put to good use in my dutch oven chicken. In addition, there were some pleasant surprises in the garden this year. 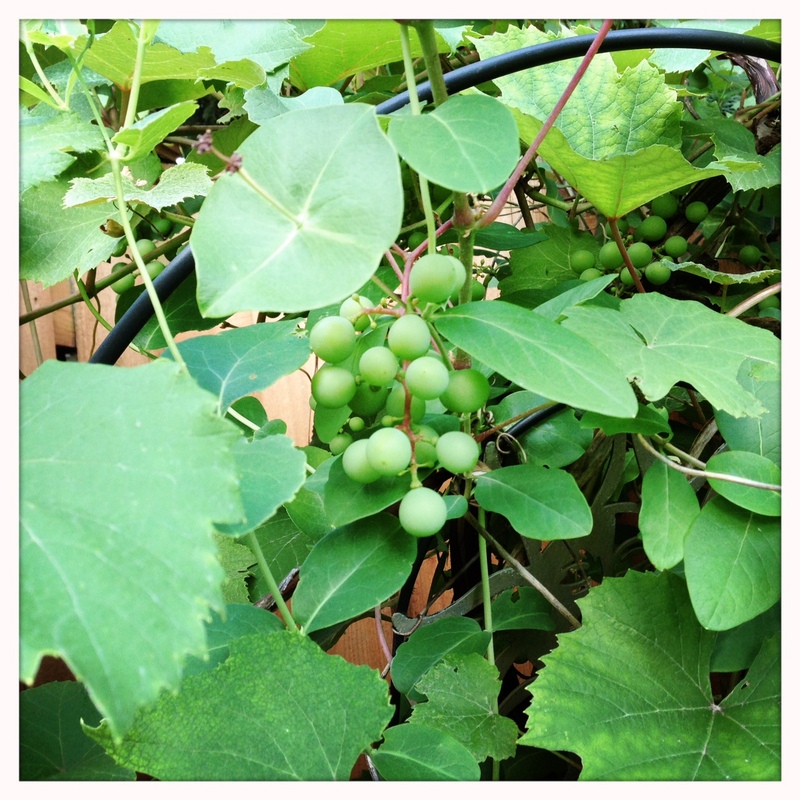 We had what we initially thought was an invasive vine that turned out to be a grape vine. I’m also looking at what will hopefully be a successful melon crop, which will be a first as I’ve never tried growing melons before this year. Two vines found their way over the fence from my neighbor’s yard. While one is an invasive ivy that relentlessly tries to choke everything I grow, the other turned out to be a grape vine. I had a grape vine growing up, and I am very excited for these to turn purple later this month! It’s only about the size of a baseball now, but growing quickly. 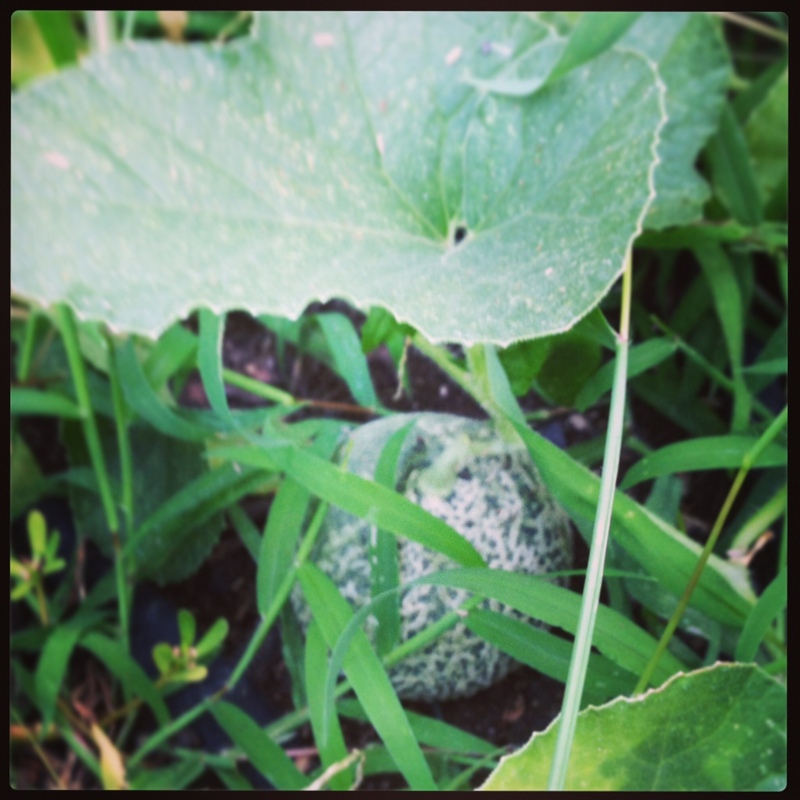 We have three nice cantaloupes currently growing and hope these will be delicious. The mini watermelons didn’t make it. My expectations for these melons was low, and these were mid-season plantings as I wanted to fill in the vacancy left by the chard, so any results are better than were expected at this point. Certainly not a great yield this year, but better than it could have been given the circumstances. In the coming seasons, I will need to be more dedicated to keeping the weeds at bay. 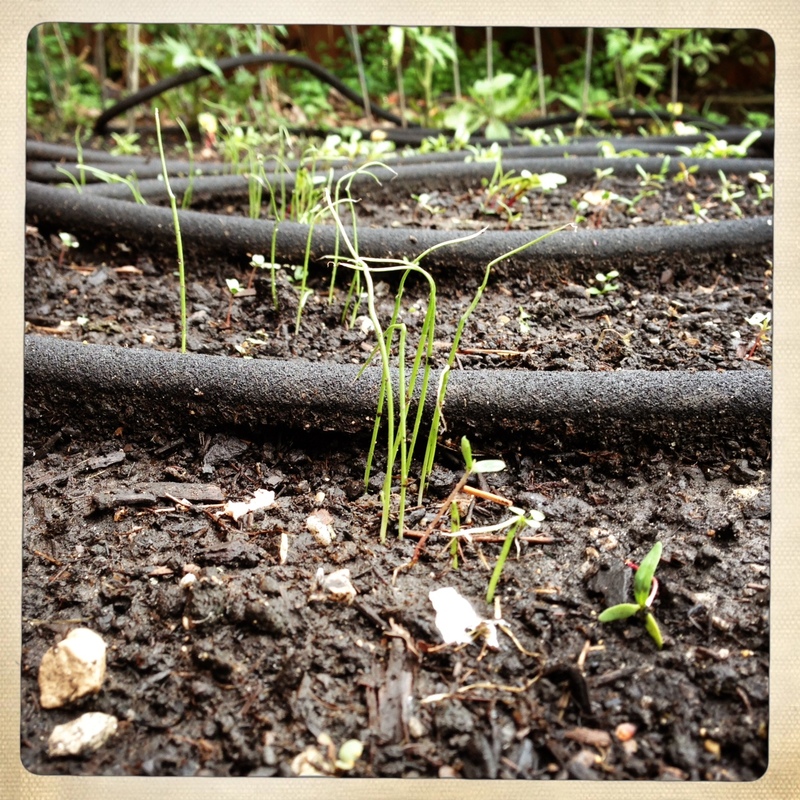 Watering was adequate, but will need to get better – the soaker hose helped tremendously this year. I think I will also need to refocus my efforts on a little less variety and a little more TLC for the plants I choose to grow. And, hopefully mother nature will cooperate a little bit better, as well. 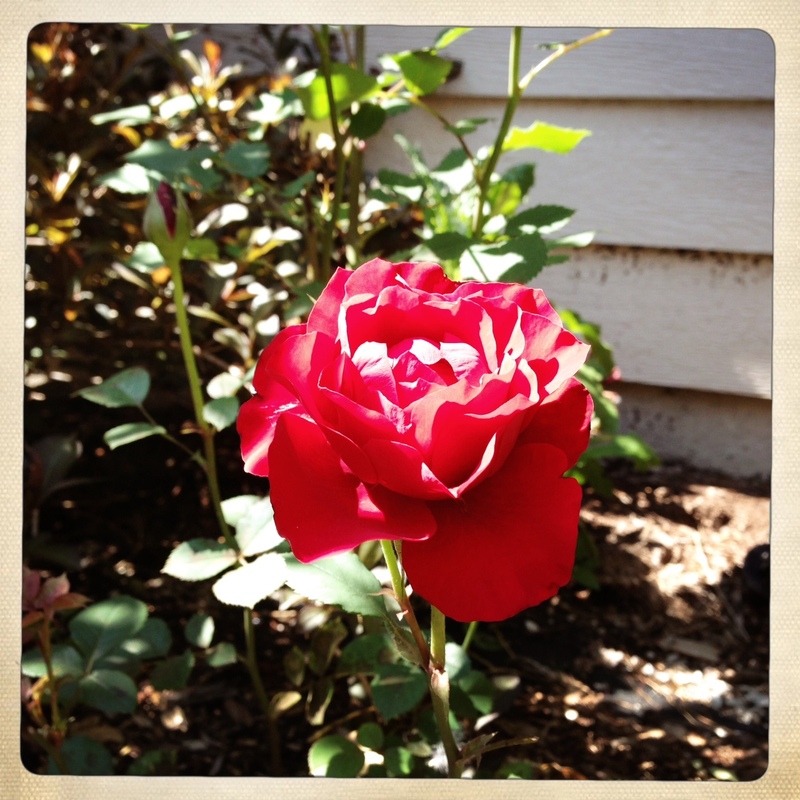 Despite the hardships of the veggie patch, our roses thrived all summer long!